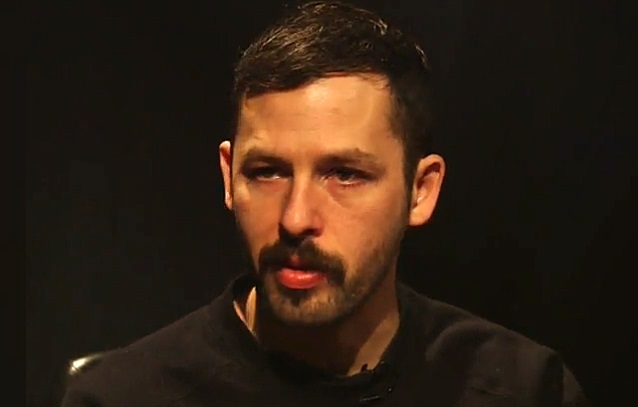 THE DILLINGER ESCAPE PLAN's BEN WEINMAN Launches PARTY SMASHER INC. THE DILLINGER ESCAPE PLAN guitarist Ben Weinman has launched Party Smasher Inc., a collective of creative professionals and artistic provocateurs. PartySmasherInc.com is a one-stop portal for musicians, photographers, illustrators, fashion designers and industry mavericks of all stripes. "I was well into my twenties, with a college degree and a corporate job, playing music with no intention of generating money or some massive fanbase," explains Weinman. "Before I had even realized it, I was making 100% of my living creating art. How did this happen? Because we ignored the 'rules.' It wasn't until I started living my artistic life with that mindset that I became a responsible creator — one who could move people through honest expression. And that is what Party Smasher Inc. is all about. We are here to celebrate the artists that are following their own path, undeterred by the trends." Weinman has also worked as remixer, collaborator and/or advisor with Kim Thayil (SOUNDGARDEN), Dweezil Zappa, DEATH FROM ABOVE 1979, Kimbra and Lil' Wayne. He's performed live with NINE INCH NAILS and SYSTEM OF A DOWN. The battle-hardened creative industry collective behind Party Smasher is made up of visionaries from the full spectrum of artistic disciplines. All of them built their reputations with a combination of talent, presentation and workaholic fervor. Ground floor Party Smasher contributors will include Jesse Cannon, author of "Get More Fans: The DIY Guide To The New Music Business" and an engineer/producer who has worked with ANIMAL COLLECTIVE, THE MEZINGERS and the MISFITS; fashion designer Kerin Rose, whose clientele includes Rihanna, Lady Gaga, Beyoncé, Katy Perry and Lana Del Rey; Thomas Bouaziz, engineer and cross-disciplinary artist under the moniker TremensS, who founded ExperiensS, a studio for design and engineering in digital/contemporary art and international tours for acts such as THE DILLINGER ESCAPE PLAN, JUSTICE, KAVINSKY, and brands like Lancôme, Swarovski and Converse; photographer and film maker James Sharrock, whose lens has captured IRON MAIDEN, MY CHEMICAL ROMANCE, ALICE IN CHAINS, RAGE AGAINST THE MACHINE, AEROSMITH, A DAY TO REMEMBER and is a regular contributor to Metal Hammer and Alternative Press; and director of events Kurt Soto who brings two decades of experience in the action sports and apparel industries to the Party Smasher Inc. collective. As a driving force behind the intersection of Vans and music culture, Soto was directly responsible for the iconic sneaker brand's collaborations with Marvel Comics, Yo Gabba Gabba!, IRON MAIDEN, SLAYER and more. The man Alternative Press cited as an industry innovator also played a significant role in the internationally respected Vans Warped Tour, Brooklyn's The House Of Vans, Vans Music Nights and more. As the site's content and contributor base develops in the coming weeks, Party Smasher Inc. will offer insight, resources and stories of trial and error in an effort to inspire and nurture more independent ventures, DIY environments and the emergence of better, stronger and more meaningful art into the mainstream marketplace. Contributor posts already include behind-the-scenes footage from Sharrock's cover shoot with MASSIVE ATTACK, a one-on-one with "Walking Dead"'s Norman Reedus, and a conversation between Weinman and his friend, Mike Patton (FAITH NO MORE, MR. BUNGLE, Ipecac Recordings). Party Smasher Inc. first emerged in 2009. The brand launched as a recorded music collective, capitalizing on the possibilities in the ever-evolving industry landscape. The first Party Smasher Inc. release was "Option Paralysis" by THE DILLINGER ESCAPE PLAN, produced and distributed in partnership with Season Of Mist in France. The best-reviewed album of the band's career, THE DILLINGER ESCAPE PLAN's "One Of Us Is The Killer" topped the Billboard Hard Rock chart in 2013. Party Smasher Inc. partnered with various labels around the world for the release, including BMG (Europe), Grind House (Japan), Remote Control (Australia) and Sumerian Records (North America). As it expands into new nooks and crannies of the creative arts, Party Smasher Inc. will continue to function as a tastemaker indie label as well.